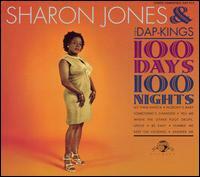 Sharon Jones & the Dap-Kings is the flagship band for Daptone Records, and The Dap-Kings are the house band for the label. I discovered this group when I downloaded 100 Days, 100 Nights from a .rar blog somewhere. I was so impressed that I immediately purchased the CD. Further reasearch led me to discover that Daptone Records is an independent label based in Brooklyn that releases funk and soul 45's, LP's and CD's from modern funk and soul artists. It also turns out that The Dap-Kings were the backing band for Amy Winehouse's Back to Black. So, that's why I liked that album so much. As of late, I have really been into the old, warm sound of soul music, even though I didn't grow up with it. I find that current music doesn't contain much substance or content at all. Perhaps it's the digital recording techniques, which produce a far inferior sound to analog. There are exceptions, of course. I'm only speaking in generalities. 100 Days, 100 Nights is full of all the soul you can handle. "Nobody's Baby" isn't even the best song on the album, it's just the only one with cowbell. This album receives my highest compliments and a strong recommendation to any one who likes, or even thinks they might like, old soul and funk.